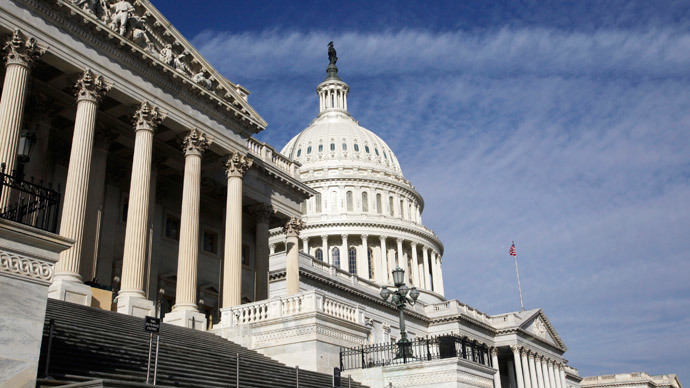 The US House has approved a $612-billion measure to fund the military. The Obama administration and many Democrats opposed the defense policy bill for its alleged budgeting "gimmicks," as well as its provisions for arming Ukrainian forces. The House of Representatives passed the National Defense Authorization Act (NDAA) for fiscal year 2016 by a vote of 269 to 151. The bill authorizes $515 billion for so-called national defense spending, $89.2 billion for an emergency war fund, and an additional $7.7 billion in mandatory defense spending that does not receive authorization from Congress. Yet the $612-billion bill was opposed by many Democratic lawmakers who have criticized the Republican majority for ignoring defense budget caps approved by Congress in 2011 to address federal deficits. Democrats say by boosting the emergency war fund (which is not in the purview of the Budget Control Act of 2011), Republicans sought to evade the law to increase military spending but will not do the same for similar caps on domestic spending. Prior to Friday's vote, House Minority Leader Nancy Pelosi pledged to oppose the NDAA for the additional war funding that comes without offsets. "The Republican defense authorization bill before the House is both bad budgeting and harmful to military planning — perpetuating uncertainty and instability in the defense budget, and damaging the military's ability to plan and prepare for the future," Pelosi wrote to her House colleagues. "As Defense Secretary (Ash) Carter said last week, Republicans' approach is 'clearly a road to nowhere,' 'managerially unsound' and 'unfairly dispiriting to our force.'" House Armed Services Committee Chairman Mac Thornberry called on Congress to pass the bill despite ongoing disputes over the 2011 law. "The idea that we would hold the military and pay and their weapons and the policies involved hostage in the hopes we can put enough pressure to have the president and Congress somehow come together to fix these other problems, I just think that's unrealistic," Thornberry said, according to the Hill. Republican House Speaker John Boehner said top Democrats were "downright shameful" for helping to pass the NDAA out of committee only to oppose it during the broader vote. The White House has threatened to veto the NDAA for the war funding provisions, as well as restrictions the bill would place on transferring detainees held at Guantanamo Bay. The White House also opposed measures in the bill that would seek to arm Ukrainian forces fighting Russian-allied separatists, and that would attempt to fund Iraqi Kurdish fighters without approval from the Iraqi government.